There’s something magical about felting your knitting. Felting is actually way easier and more fun than you’d think and once you start you just can’t stop! 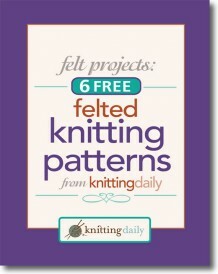 That’s why we’re giving you these exclusive, free felted knitting patterns! 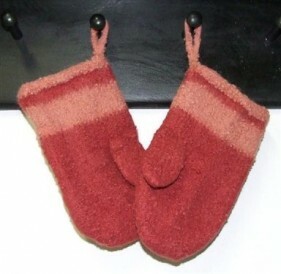 The first felted project I made was a pair of slippers. It was absolutely amazing to knit a Shaquille O'Neal-sized pair of slippers, throw them in a hot wash, and pull out a pair of Mom-sized slippers. They were beautiful, and my mom still wears them, even though I've had to patch them a couple of times. We’ve put together six felt projects for you in our new free eBook Felt Projects: 6 FREE Felted Knitting Patterns. 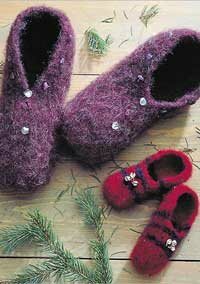 From slippers to beads to bags, you’ll have a blast practicing the art of felting your knitting. From felted bags to projects like slippers and gloves, these free felt projects are sure to put a smile on your face. Felt knitting results in a fabric that is dense and sturdy, yet flexible. The beauty of felt is you can start with nearly any design, and create a felted item from it. 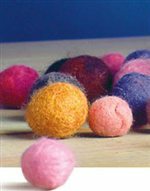 Whether you imagine making felted purses and bags, or other felted wool projects, there’s something for you to try in this collection. From beginner to experienced, these felt knitting patterns are packed with style and enjoyment for the maker and the wearer. Marcy Petrini had long been intrigued by felt making, but when she tried it she didn’t like the process: too wet, too messy. When she discovered felting in the washing machine, she fell in love with experimenting. As she discovered, she prefers to knit an “elephant size” item, felt it, and wear it. Her challenge was to determine the combination of pattern, yarns, needles, gauge, and pre-felting size that would result in perfectly fitting felted projects. These slippers are a good place to start learning how to felt for any knitter who’s intrigued. Amy Clarke Moore witnessed the transforming effects of felting at her college Laundromat when she saw a young woman at the other end of the room hold up a doll-size sweater by its shoulders. She’ll never forget the horrified look on the woman’s face as she cried, “my Peruvian sweater!” While the young woman’s felting experience was accidental and traumatic, felt making on purpose is magical. The wet felting process will turn basic materials into magical felted beads that are just plain fun. The wet felting process is perfect for creating a dense tough surface to protect your hands when taking hot pans out of the oven. This felted wool oven mitt pattern is perfect for everyone on your gift list, no matter the season. Designer Beth Lutz has created this perfect project for beginners learning how to felt or experienced knitters looking for a durable, yet stylish addition to their kitchen necessities! When it comes to felted purse patterns Jennifer Tallapaneni has made a stand out classic. This pattern will help you created felted handbags with exceptional embroidery accents that you’ll be proud to show off. 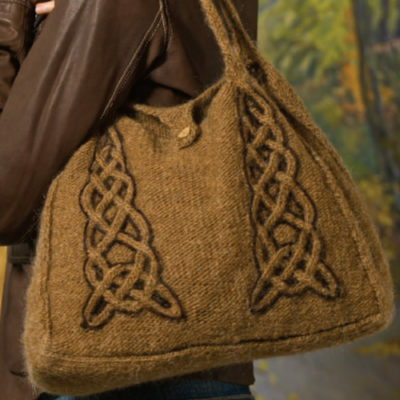 The designer uses an intricate cable to add structure to the Celtic Tote which adds a wonderful stylish touch. These adorable felted bags are perfect for your everyday essentials, not too big, but not too small. You can even make personalized felted handbags to give to your crafty friends and as gifts. With a simple top-down construction and free-form embroidery applied before the felting process, these plump little bags can hold all necessities and help tie an outfit together. Sometimes we all need a big bag to hold our workbooks, computer or other daily needs, and sometimes we just need a great bag to go out with. Laura Irwin provides the perfect solution with this felted knit purse. 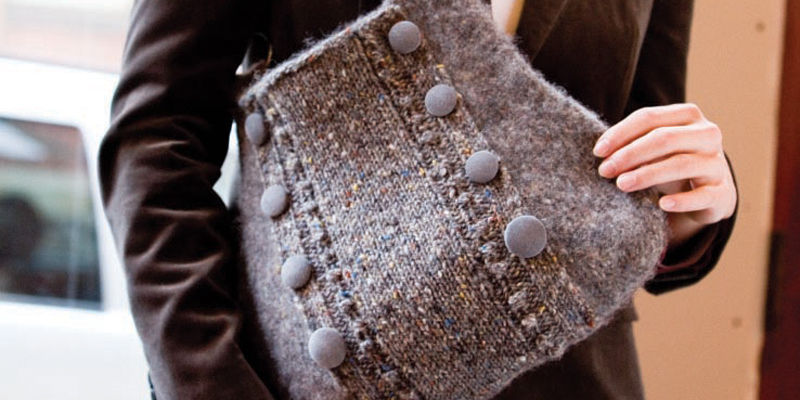 Because of the baubles and buttons the final design is a bag you can easily can take to work or out on the town. Laura began by knitting a rectangular base with the yarn doubled for extra thickness, then she picked up stitches around all four edges and to the body of the bag to the top. For added interest, knit a single stockinette-stitch panel decorated with bobbles and buttons and attach to the center of the front, base, and back. Whether this is your first try or you’ve felted before, these felt knitting patterns are sure to keep you and your washing machine busy! Put some fun in your knitting with these six free felted knitting patterns. So download Felt Projects now, dig out your feltable yarn and your needles, and get knitting (and felting! ).